The bus system in Ho Chi Minh City covers most tourism destinations within and nearby the city with 152 routes. 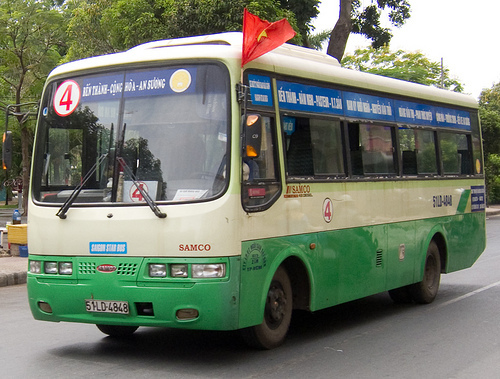 Buses in Ho Chi Minh City can be realized by the white cover with a light green strip. The price for bus ticket fluctuates between 3,000 and 10,000 VND, depending on the distances and the type of buses. Buses in Ho Chi Minh city might not be as crowded as those in Hanoi, but the problem is the quality of the cars and degrading services. Moreover, the distances between the bus stops and tourist destinations are pretty far, aggravated by the long time it takes to wait for a bus. That makes this type of public transportation not the best choice to explore the city. Also, Ho Chi Minh City Bus are often named by the beginning and end points, so check your bus number carefully before getting on it. photo by charles haynes from Flickr under Creative Commons terms. #147 (Cho Lon Bus Station – Tan Son Nhat) and #152 (Trung Son Resident – Tan Son Nhat): These two route have stops at Tan Son Nhat International Airport, and with these buses, you can easily get to the center of the city. Bus#147 will head to Cho Lon area while bus #152 will go to the Ben Thanh Market, a short walk from Pham Ngu Lao backpacker area. #30 (Tan Huong Market – Suoi Tien Resort): this route runs a long distance from Tan Binh county, cross the center of the city and head to the north east of the city. Along the route there are many tourism destinations such as Suoi Tien Resorts or Hung Temple. You can catch this bus in many stops in downtown area like Vo Thi Sau or Pham Ngoc Thach. #19 (Saigon – Trung Linh – National University): This route begins from Ben Thanh Market, head to the center of the city and cross the Saigon Opera House. Then it comes to Highway 1A before heading to the National University.